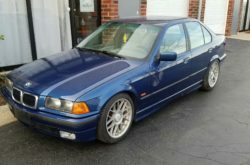 Hey Guys, I am new to this forum, I always loved the e34 body and always wanted to get one, so i finally got one. Found one very clean in NC and shipped it here. Decided to rebuild the whole engine with all original bmw parts before throwing turbo on it. Adding few pics from by build. It is still work in progress but I am getting there, maybe another 2 weeks before Dyno. Welcome! Looks great! We have a new members introduction page near the top of the home page. Most people won't see this because not many post in this section very often. Just a little update, took it to the dyno few days ago. 400whp with 14psi and 66mm turbo, raised redline to 7K rpms. Refreshed stock motor with new bearings, new rings, new timing components, cometic headgasket, apr bolts. What engine are you using ? What an impressive project you got there. Any updates this year? Nice, that setup looks great.